Do you need a bigger file? The file available on this site is 688 x 1024 px. To obtain an alternate file type or higher resolution copy, please contact the owning institution. Scope/Content: Extensive contemporary annotations and marks throughout. Annotations index key terms and concepts in the printed text. The marks were made for the purposes of casting-off the text in preparation of a new edition. The indexical annotations and title page drawing are also presumably part of the intended new edition, which, according to evidence in subsequent editions of Allestree's The Art of Contentent, was never realized in print. 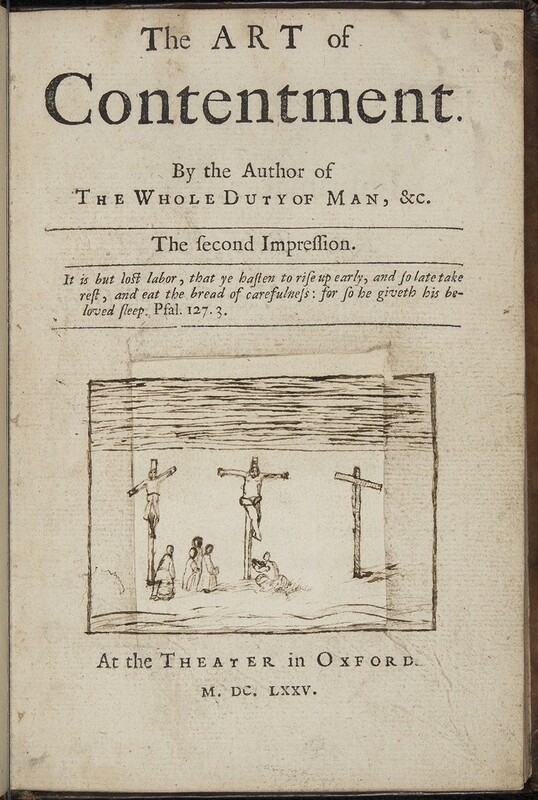 Title page mutilated, with vignette of Sheldonian Theatre cut out. Piece of paper with ink drawing of the crucifixion pasted onto verso of leaf, covering the cut-out space. Ink drawing continues onto the title page leaf itself.